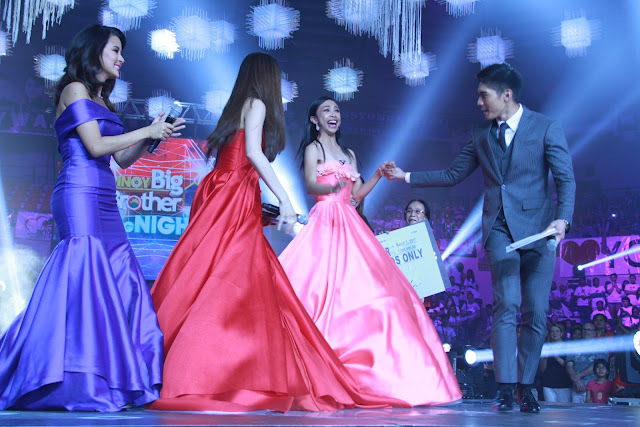 Teen housemate Maymay Entrata emerged as the Lucky Big Winner of “Pinoy Big Brother Lucky Season 7” and made PBB history as the first Big Winner in the longest season of the hit ABS-CBN reality show, beating co-housemates from celebrity, teen, and adult editions. The “Ms. Wacky-Go-Lucky of CDO” garnered a total of 42.71% of votes and was formally welcomed by her family, friends, and fans from the outside world in the jampacked Big Night held last Sunday (March 5) at the Alonte Sports Arena. In an emotional speech, Maymay thanked all her fans for helping her reach her dream. The newest PBB Big Winner also encouraged everyone to continue to dream. “Don’t be afraid to dream. Don’t ever forget where you came from and the people who helped you in your journey. If your dreams are already within reach and you stumble along the way, you just have to get back up on your feet and rise from it. Remember why you started and why you made it that far to reaching your dream,” she said. “Don’t be afraid to be true to yourself and to others because it is the key to your dreams and success in life,” she added. As the Lucky Big Winner, Maymay won P1 million, a house and lot from Camella, and an Asian tour package for two from Von Dutch. Fellow Big 4 housemates Kisses Delavin, on the other, finished as the second Lucky Big Placer with 31.27% of votes and took home P500,000; Yong Muhajil as 3rd Big Placer with 21. 52% of votes and won P300,000; and Edward Barber as the fourth Lucky Big Placer with 4.49% of votes and got P200,000. Before the worldwide Twitter trending Big Night last Sunday, the 5th, 6th, and 7th Lucky Big Placer awards were given Saturday (Mar 4) night to Tanner Mata, 2-in-1 “Hashtags” housemates Mccoy De Leon and Nikko Natividad, and Cora Waddell respectively. Each of them received P 100, 000. The Big Night ruled national TV ratings and won its respective timeslots last weekend. The show scored 19.9% against rival’s 10% last Saturday (Mar 4) and hit 20.6% against rival’s 18.8% last Sunday (Mar 5). The “Pinoy Big Brother Lucky Season 7” Big Night was also graced by PBB alumni that include Big Winners Kim Chiu, Jimboy Martin, Daniel Matsunaga, and Miho Nishida, ex housemates from past editions Tommy Esguerra, Joshua Garcia, Loisa Andalio, Zeus Collins, Ylona Garcia, Bailey May, Dawn Chang, Yass Pressman and other former “PBB Lucky Season 7” housemates. For the past 11 years, “Pinoy Big Brother” has remained one of the most watched programs in the country, a consistent top trending topic in social media, and the most viewed reality show online via iWant TV.